said Murielle Chuzeville, General Manager, Eccoh High Performance Solutions at PolyOne. Eccoh 1025/1C is an e-Beam cross-linkable, low smoke and fume, non-halogen flame retardant solution. According to PolyOne, it has good anti-adhesion and flame retardant properties combined with superior processing characteristics. 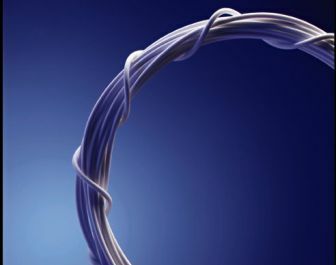 Appliance wire manufactured using this solution can meet UL 1581 (125°C) rating requirements. Potential applications for this material include the internal wiring of appliances, white goods, test equipment, motor lead wires, business machines and other office and control equipment where elevated temperature performance is required. With this new Eccoh solution, the company says wire manufacturers can make products that comply with AWM UL 758 requirements with FT2 flame performance at 125°C temperature rating. The material typically does not require pre-drying before use, and can be processed on extrusion lines set up for vinyl or polyethylene. PolyOne said this polymer solution has improved elongation-at-break properties at elevated temperatures and unique anti-adhesion properties to streamline secondary processing and reduce scrap. The anti-adhesion properties of this new Eccoh solution are also beneficial to wire and cable manufacturers, who typically apply an epoxy-based insulation coating on top of cross-linked polyethylene (XLPE) sheathing to provide better heat and insulation resistance. This epoxy insulation coating must then be cured in ovens at high temperatures like 125°C, which often causes the XLPE insulated wires to become tacky. The tacky XLPE insulation makes it difficult to split the wires, and using too much force can tear the insulation and sheathing layer, ruining the cable.